Colonel Pritzker is proud to have been awarded the 2016 Spirit of Hope Award, sponsored by the U.S. Department of Defense. Comedian Bob Hope was legendary for his support of the U.S. armed forces, having entertained them all over the world for almost 50 years. He headlined 57 U.S.O. tours through four wars, often in harm’s way. As a tribute to him and to those who reflect the same level of commitment, the U.S. Department of Defense has selected recipients annually for its Spirit of Hope Award since 1997. These men and women—nominated by each branch of service embody the character and selflessness of Hope in activities that support the military. 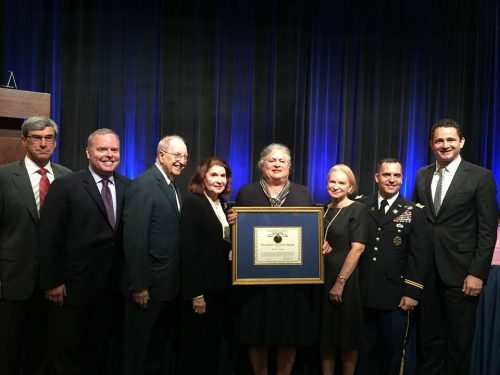 In 2016, recipients included our own Colonel Jennifer Pritzker, the U.S. Army nomination; Ms. Kellie Pickler and Mr. Kyle Jacobs, the Office of the Secretary of Defense’s nomination; Mr. Marc Tarter, the US Marine Corps’ nomination; Mr. Timothy Bryant, the U.S. Air Force’s nomination; Cmdr. Michael Smith (retired), the U.S. Coast Guard’s nomination, and Debi Demick, the director of Horses Helping Heroes Project.